14 pp. Roman, 841 pp. This catalogue is an inventory of the folktales of three ethnic groups: the Bushmen (San, Masarwa), the Khoe­khoe(n) (Khoikhoi, Hottentots) and the Damara (Dama, Bergdama). These peoples are most likely the ancient in­habitants of southern Africa who lived there before the arrival of the Bantu-speaking peoples. Though they differ as to their original forms of economy (hunter-gatherers and herders) they all speak click languages that do not belong to the Bantu languages. The Rehobothers and so-called Coloureds of Namibia, people of mixed race whose mother-tongue usually is Afrikaans, have been included here, for they not only have kept many elements of Khoisan beliefs but always have lived in close contact with the Khoisan groups. Comparative studies proved that there must have been a continuous exchange with and influence by neighbour­ing peoples from time immemorial. A number of tales which Khoisan peoples share with Bantu-speaking Africa can be found already in early 19th century sources, others appear only in latest collections of the northern bor­der region. The same can be said of tales originating from European or Asian traditions. Many have been thor­oughly adjusted to Khoisan life and thinking and are regarded as own ancient traditions because they were orally handed on in the family. Therefore the Catalogue does not separate ancient Khoisan lore from acquisitions of later times. It lists all tales which were told by Khoisan people and said to have been learned orally. Biblical stories were told only in a few cases and were not catalogued. Chapter 5 shows the tales with strong Herero fla­vour. International tales can be recognized by their ATU number. The catalogue, divided into two parts, represents oral traditions in a very broad sense: Not only myths, trickster, animal and fairy tales are listed but also anecdotes and legends, including ghost stories, contemporary legends and tales which explain place names. Section I on celestial bodies, deities and mythical trickster tales and the last section, novelistic tales and legends, are given in more detailed summaries and are backed up by a considerable number of statements about folkbelief. Section I, which documents the ancient Khoisan worldview, shall facili­tate not only folktale studies but general Khoisan research. The last section shall serve to further African legend studies, for until now special collections and studies do not exist. Chapter 9 The Sources, records all sources, published and unpublished, from which tales were indexed. It points out whether the tales were original record­ings or reproductions. 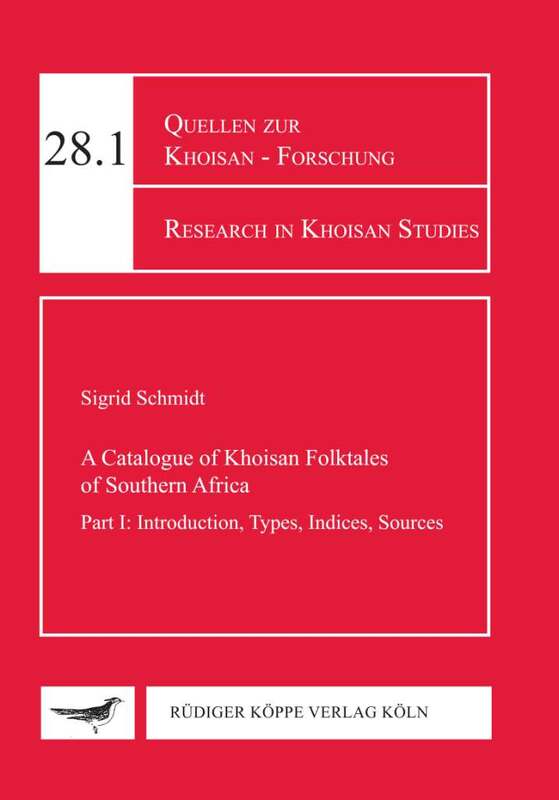 In addition, the catalogue notes variants of sub-Saharan African peoples, particularly of the neighbours of the Khoisan, and literature on tales or related subjects. These lists are a random collection which the author noted down over the years and make no claim to be exhaustive; perhaps they may help other students. The folktales that are the basis of her catalogue have been published by Sigrid Schmidt in the ten volumes of her series Afrika erzählt (1991–2009). Following the link at the bottom, you will find the full review text by Robert Cancel (pdf file). 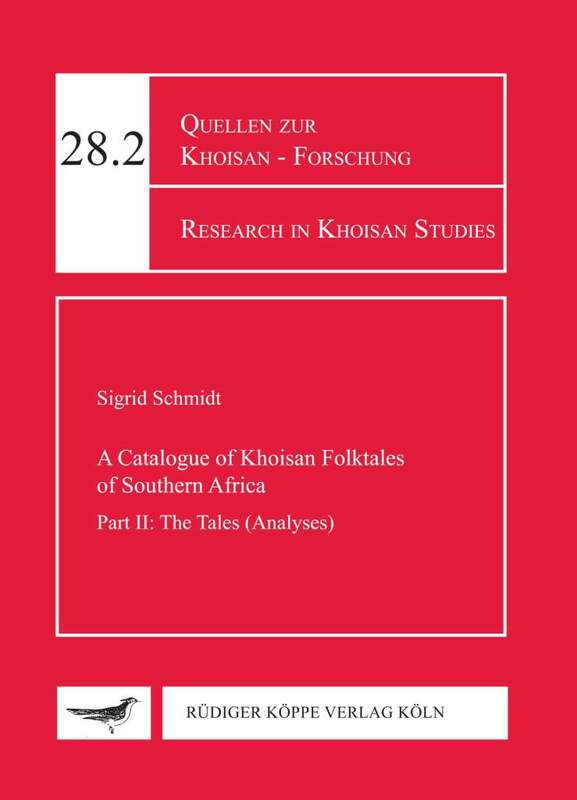 Der 1989 erstmals von Sigrid Schmidt veröffentlichte bilinguale Katalog der Khoisan-Volkserzählungen des südlichen Afrikas (deutsch/englisch) liegt nun, fast ein Vierteljahrhundert später, in einer völlig überarbeiteten und rein englischen Ausgabe vor. „Alle historisch und komparatistisch arbeitenden Erzählforscher/innen [werden] die Veröffentlichung dieses sorgfältig erarbeiteten Katalogs begrüßen,“ hieß es bereits in meiner Besprechung der 1. Auflage (Fabula 32  343 f.), und diese Einschätzung läßt sich kaum mehr steigern. Der hier anzuzeigende Katalog übertrifft nicht nur alle bisherigen afrikanischen Typen- und Motivkataloge an Gründlichkeit, sondern kann gleichsam als Muster eines thematisch angelegten Typenkatalogs bezeichnet werden. Das Erzählgut des südlichen Afrika läßt sich anhand ausführlicher Inhaltsangaben und detaillierter Analysen jeder Fassung leicht erschließen.